A plane full of oil rig workers crashes in the Alaskan wilderness. While the survivors gather themselves and wait for rescue, they come under attack from a pack of grey wolves. When it becomes clear that the wolves will not stop attacking until they are dead, the survivors start a trek through the forest in the hope of escaping. I was a big fan of Joe Carnahan's debut film Narc, and after his entertaining but bloated action blockbuster The A-Team failed to bust any blocks he retreated to a lower budget and profile with this film. 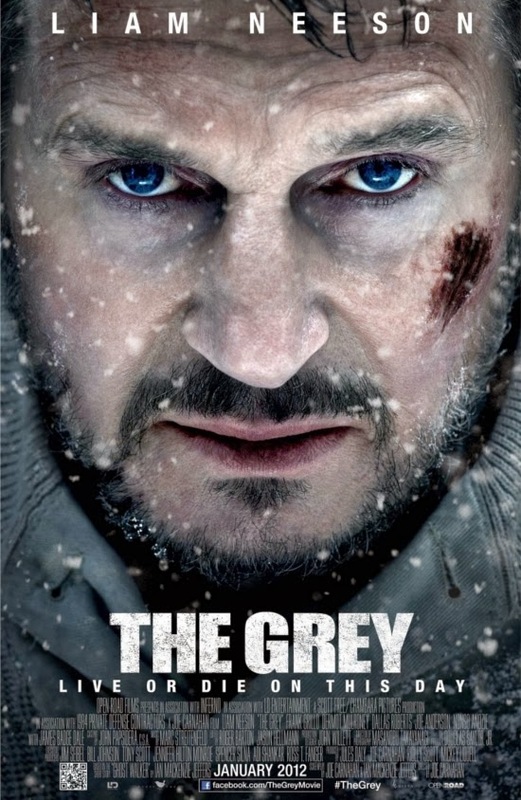 The Grey come to cinemas with the reputation already set for being "the film where Liam Neeson has a fistfight with a wolf", and certainly he does punch at least one wolf in the head before the first half hour has passed. Neeson has undergone a remarkable career transformation in recent years, moving away from the dramas and smaller pictures he made his name upon in favour of fast-paced, brutally violent action thrillers. It is easy to glance at The Grey and see it form part of that run of films, but it's also inaccurate. There's a lot more going on here than Liam Neeson punching wolves. Neeson plays Ottway, a suicidal hunter hired to shoot down wolves before they attack a team of north Alaskan oil drillers. When the plane crashes, he is the one best equipped to deal with the crisis. He is also the one with the least to gain in surviving. This creates a very interesting character, and be exploring those depths Neeson gives one of the best performances of his career. It is a raw, angry, muscular performance, portrayed in alternating moments of rage, humour and silence. It's award-worthy stuff, but of course it's hidden inside what seems from the outside to be a survival thriller akin to The Edge or Deadly Pursuit, so of course it was overlooked. The Grey is dark stuff. There are a few moments of levity and humour, but all up it's a pretty relentless and violent thriller. The wolves are presented as terrifying monsters, and certainly on some levels the film mines traditional horror movie tropes. There are moments of sinking dread. There are a bunch of momentary scares and jumps. These are weaved through the story of the characters, who alternately self-destruct and rally together and their situation worsens. Some of the men respond to their situation with blind terror, others with false bravado, yet more with understated acceptance. It's a stunning exploration of masculinity: sure, Hollywood makes movies with all male casts all the time, but when they do it's rare that they also interrogate that male identity. Terrence Malick's The Thin Red Line hangs over much of The Grey, and I would be dumbfounded if it wasn't a major influence on Carnahan's film. The narration-heavy, meditative opening is torn straight out of Malick's war film, and Marc Streitenfeld's sparsely used, thoughtful musical score echoes much of the work Hans Zimmer produced for it. It's possibly my favourite element of The Grey, adding a thoughtful, melancholic patina to the otherwise savage and grim tale of survival and bloodshed. I was really surprised by The Grey. I came in expecting Liam Neeson fighting wolves. I came out having seen something really quite unexpected and rather special. Not only is this the 80th film review published on The Angriest, it's the 650th post overall. Thank you for continuing to read this blog. I always felt that Neeson returned to films after Natasha Richardson's death determined not to get too involved with the industry, to basically get as much money as possible for as little commitment as possible. A couple of weeks of punches-people-for-money is an easier way to get back to the kids than investing your consciousness and emotions into a low-paid film that might win you an award that's just going to taste like ashes anyway. Some moments of The Grey - particularly in the last 15 minutes - felt so raw that I found it a little difficult not to imagine there being an autobiographical element to the emotions on screen.